Lake Providence Missionary Baptist Church in Nashville, TN, was founded in 1868 with a vision to reach all people with the Gospel from the cradle to the grave. Throughout our history, we have had a few different facilities, leading up to our current church building established in 2003, and seating 3500 people. 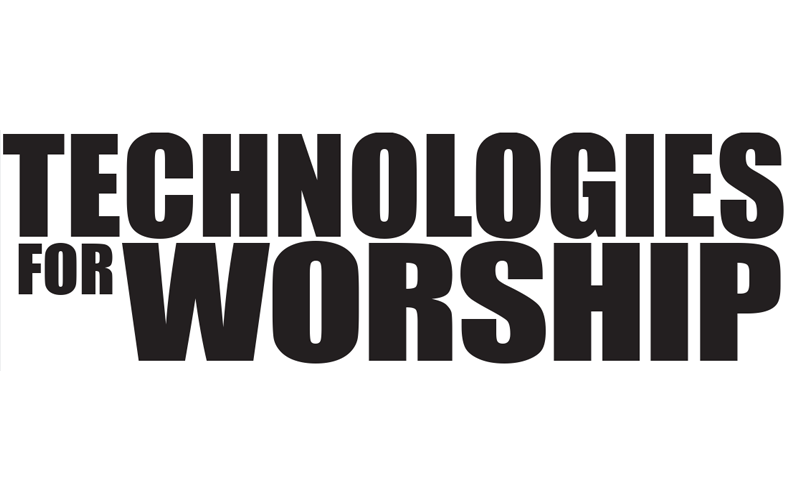 We provide two worship services every Sunday, and each service includes a mix of contemporary worship with traditional value, to appeal to all ages within the congregation. 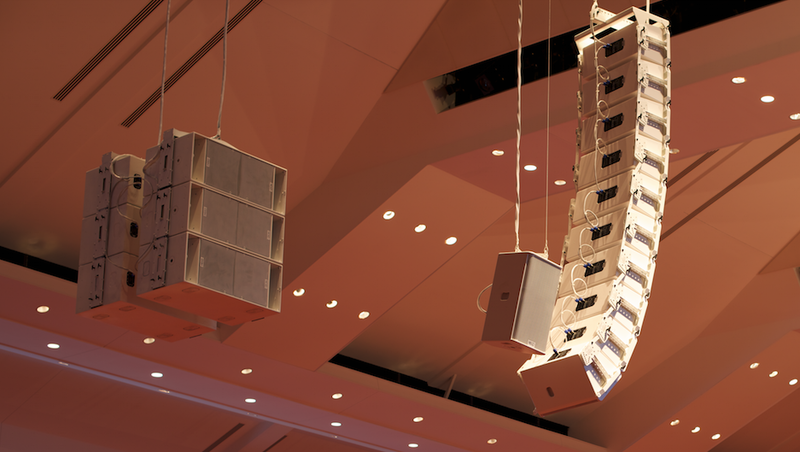 As of August we completed the installation of our an all-new sound system at Lake Providence, including the first House of Worship installation in North America using the NEXO GEOS12-ST sound reinforcement system. Very pretty sounding! We had known we needed to upgrade our sound and audio for several years, as our old point source speaker system never did a great job of delivery. Intelligibility of music and speech has always been an issue in certain areas of the sanctuary, so we were determined to find a solution for our challenge. Before deciding on the NEXO system, I did a lot of research, speaking with touring groups, calling on engineers at poplar large venues like Carnegie Hall, our local Nashville symphony (Schermerhorn), and Tennessee Performing arts Center and talking with installer/integrators to try to determine the best fit for Lake Providence. I listened to several churches and attended events to get a good idea of what was available. While listening, I had to factor in the differences in rooms and sound equipment. The first time I heard a NEXO system, I was actually at a cancer benefit in a bar called Third and Lindsley in Nashville, I had gone there specifically to listen to the NEXOs being used. I also visited The People’s church in Franklin using a NEXO system. After hearing these systems I knew NEXO was what we wanted for Lake Providence. 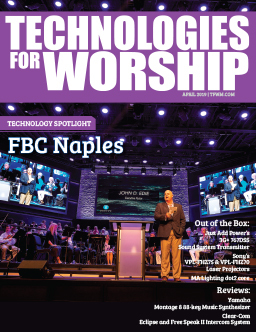 Jason Spence at JSS Sound agreed that the NEXO System would be the best fit for our church. It had several key elements we wanted outside of the crisp, clear sound, including the service track record and longevity of the parent company. We knew Yamaha would stand behind the product, and we trusted their reputation. We had to do all new wiring throughout the facility, including all new speaker wire and power changes to accommodate 30amp circuits for NEXO amps. There was a lot of discussion about where we were going to hang the speakers – there are 1668 lbs of center-cluster speakers (6 in all) hanging 30 feet over the pastor, so there was some concern. Without a second thought we had a professional rigger come in to make sure the set-up would be safe, and that the infrastructure could support the hang. Then came the Paper-Mache Array: I hung a cardboard mock-up of the planned array in the room to provide a visual example for the congregation before deploying the system. We currently have two line arrays hanging on either side of the center cluster (10 cabinets per side). 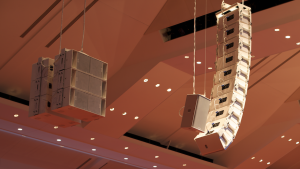 Our sub system is firing in a cardioid pattern to ensure that most of the low-end sound goes towards the audience and not towards the choir or pulpit. It was important for us to do this to adequately fill front of house and for comfort by reducing the perception of sound volume and not pounding the choir and pastor with low-end audio. Jason Spence set the speakers for us and, along with Kevin Lee Hughes, tuned the room once they were installed to maximize the potential and ensure that every seat in the congregation hears the same audio, at the same quality. We also had help from NEXO’s NS-1 master Joe Rimstidt, who really helped us with product application and placement to customize deployment for our room, and consultation to maximize sound quality. Because of the width and depth of the room, we decided to purchase the GEOS12-ST (stadium speakers) for the sake of clarity and a more pronounced high frequency, which helps with the intelligibility. This box is to be appreciated by an audiophile. The length of our main sanctuary is around 120ft and includes a balcony, so we had to consider specific coverage areas. The consistency of the components and sound in the NEXO line allows for a really even delivery through out the room, with very little difference in sound from the front seats to the back, and regardless of whether you are in the lower level or upper level. Directly after we purchased the system, a company called Technical Innovations in Nashville came in to treat the room with panels from Perdue Acoustics, which was phase two of our audio update. As a result, we may revisit our room tune soon. 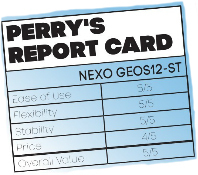 We’ve been very happy with the NEXO system. 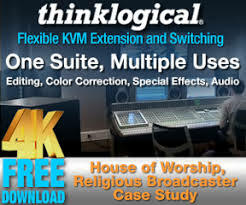 It delivers exactly what it promises and worship has never sounded better.